Now that we’ve had a good look at the Nikon Z7, both inside and out, let’s see how it stacks up for infrared photography. 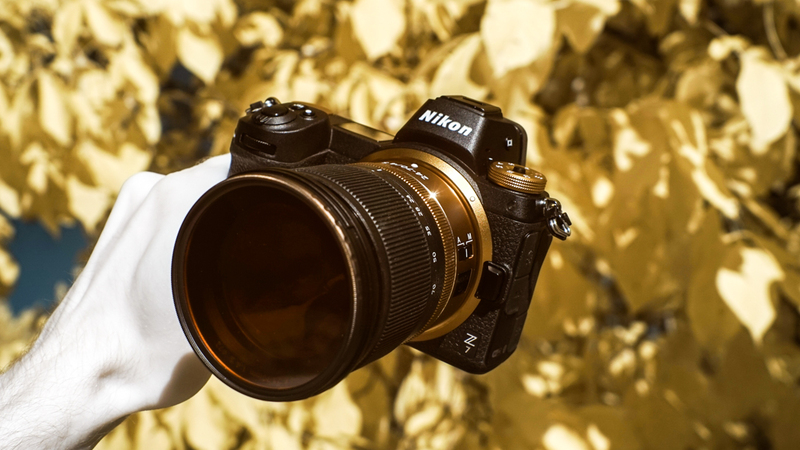 For testing, we’re using the same Nikon Z7 from our teardown article (which you should read if you haven’t already), converted to full-spectrum with our whole range of infrared filters. 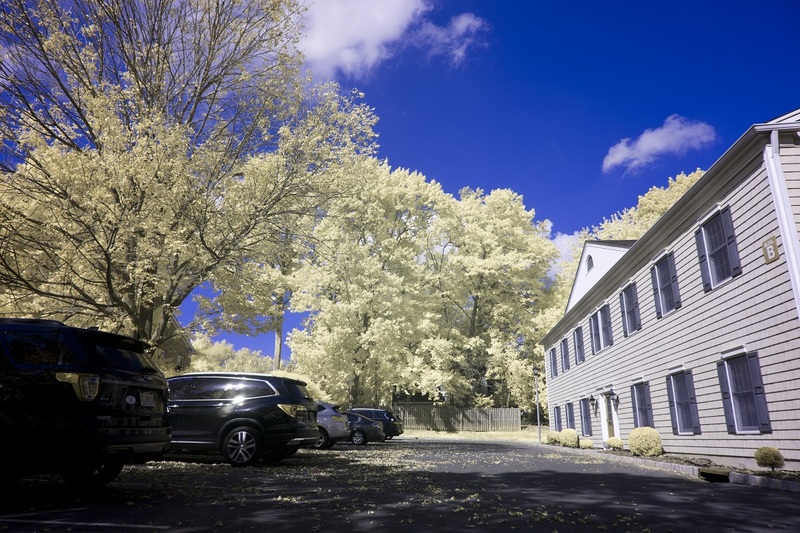 Our main focus areas are ease-of-use in regards to infrared photography specifically, infrared color performance, and whether or not the camera has some of the common problems we see when converting certain models to infrared such as sensor artifacts and infrared light leaks. Disclaimer: That special edition Gold Nikon Z7 B (for bling) is, in fact, a regular Z7 shot with a 590nm infrared camera. Sorry. With every new Nikon model that comes out, here at Kolari we ask: “Will it set a custom white-balance?”, and the answer is usually no. Nikon cameras are notorious for how they struggle to set a custom white balance in IR wavelengths. Infrared Nikon shooters can still use custom DNG profiles to get around this problem with post-processing, but it is always nice when we can skip a step in our workflow. So, has the Nikon Z7 answered the prayers of Nikon infrared photographers? Partly, yes. The Nikon Z7 will set a custom white-balance balance, bu only with our 720nm and 850nm IR filters. This is great news for black and white infrared Nikon shooters, or people who love the subtle color look of the 720nm IR filter. However, color infrared shooters will still be stuck using custom DNG profiles to get the right look. The Z7 simply will not set a white balance for our 550nm, 590nm, and 665nm IR filters. 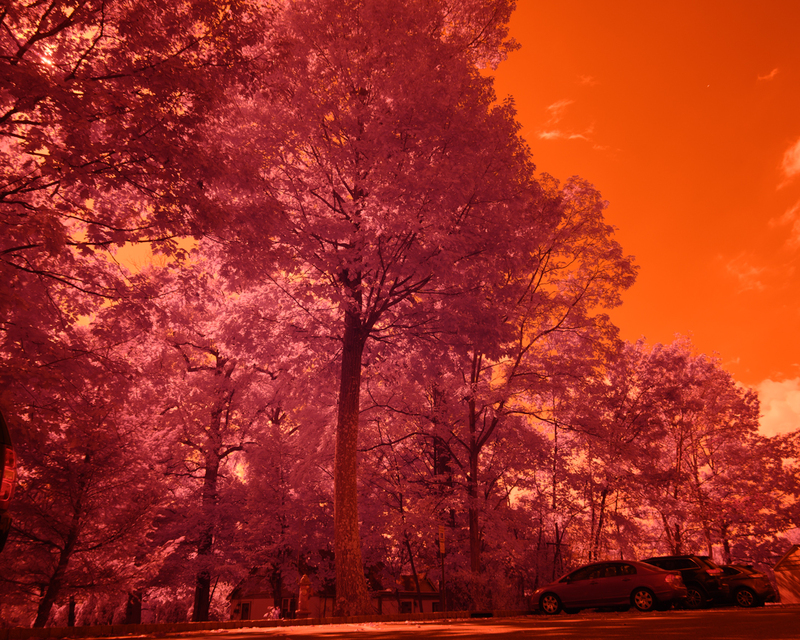 Your color infrared RAW files will all look something like this out-of-camera. Our DNG profile tutorial will help you get them looking the way they’re supposed to. Every camera processes colors a little differently, especially when shooting in the infrared spectrum. This part of the review will be partly subjective. I’ll discuss the quality of the images and colors based on how they appeared to us here at Kolari and relative to what we’ve come to expect as the ‘standard’ infrared look for each different IR filter. 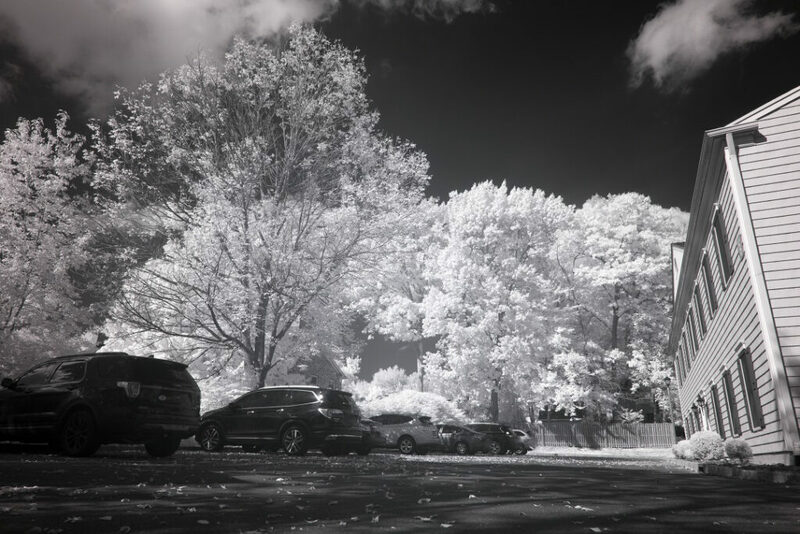 Overall, the Z7’s infrared photography performance was excellent except for a few quirks. Strangely, the 550nm filter colors were coming out of the Z7 a bit harsh. On the left, I performed a layered channel swap. On the right, I attempted a red/blue channel swap with a global hue shift. While the right photo is a bit easier on the eyes, neither of these came out looking like what I expect from the 550nm filter. The colors are a bit burnt and not very natural looking to my eye. This could be the result of poor RAW processing on my end, so we won’t say anything definitive about this yet. The full-spectrum Z7 brought out a beautiful shade of warm gold with the 590nm and a basic red/blue channel swap. My personal favorite. The 665nm also came out looking excellent with a standard Red/Blue channel swap applied. The 720nm looks beautiful as always with a red/blue swap. 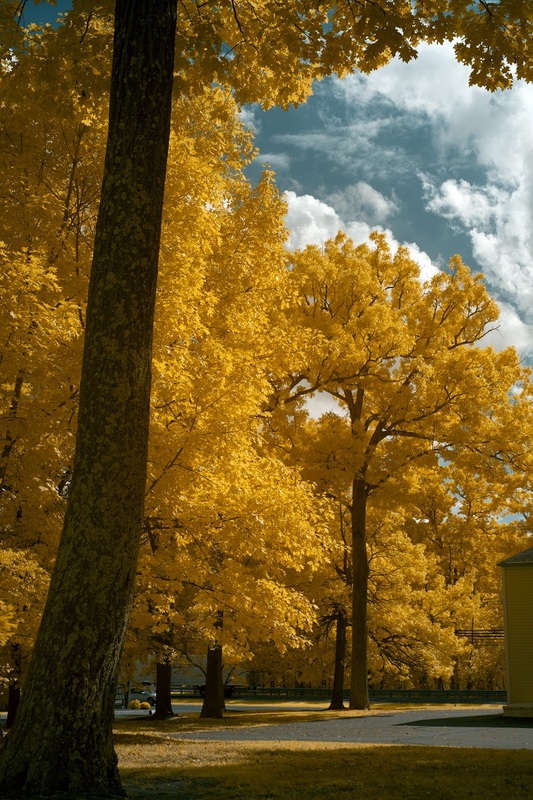 Remember to desaturate the warm tones when using this filter if you’re after the crisp white tree look. I did not do that here so we can judge the photos as unmodified as possible. White trees with black skies and no color to be found. The Z7 is an excellent camera for black and white infrared photography. Lastly, some love for the Blue IR crowd. No channel swap needed here, and the image from the Z7 is one of the better ones we’ve seen with this filter. Previously hidden sensor artifacts and other problems can suddenly appear when a camera is converted to infrared. 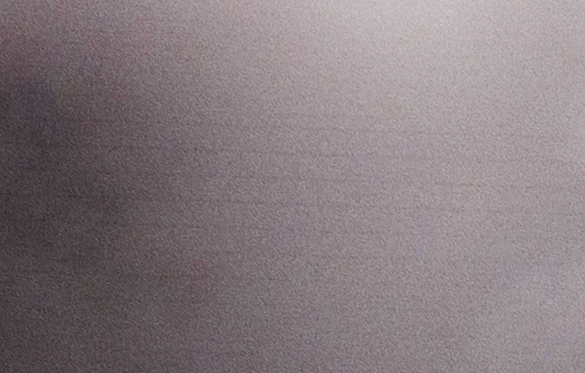 One issue we’ve seen in models like the Canon EOS M3 and A7R are vertical or horizontal lines in the image. These artifacts are usually an inherent characteristic of the camera’s sensor and become more noticeable after conversion to infrared. The Nikon Z7 does, in fact, have these sensor lines, though they only appear in certain parts of the image at certain times. They are also very subtle. We need to zoom and in and push contrast extremely high to show you what we’re talking about, but the sensor lines are there running horizontally along the long side of the frame. 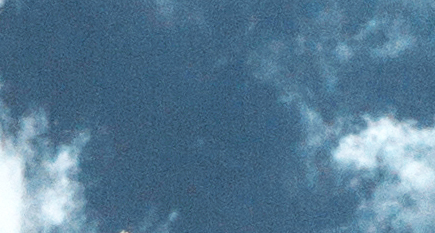 If you look closely you can see them in this section of sky from the 720nm sample shot. And again, this time more clearly, in a section of cloud from the 850nm sample shot. These lines will be very difficult if at all possible to see in the average landscape shot or even most photos. However, there are certain applications for high-resolution camera like the Z7 where these sorts of artifacts will matter, and we want to make sure our users know this before they choose a camera to convert. Another common issue that hurts a camera’s infrared utility is a part that we’ve discovered mainly in Sonys and Nikons so far. Models like the A7R III and D750 have an internal IR LED. This part emits a small amount of infrared light that is used to monitor the shutter mechanism and help maintain shutter speed accuracy, especially for long exposures. It can cause huge light leaks that make a camera almost unusable for infrared long exposure photography or astrophotography. 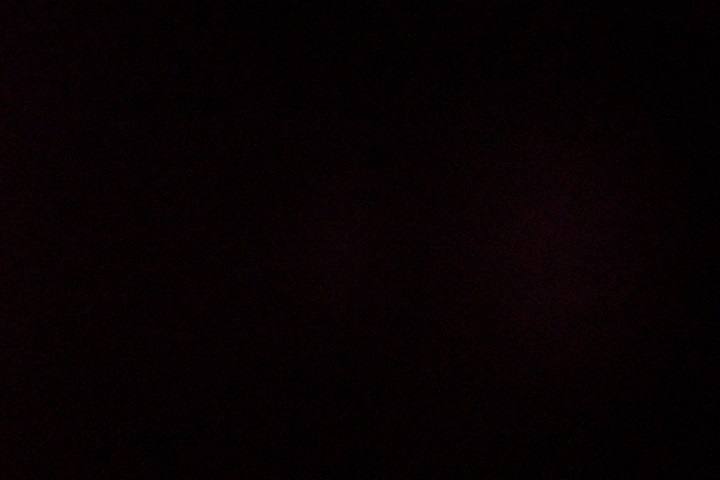 You can test this yourself by taking a photo with the lens cap or body cap on in a dark place with the highest possible ISO and longest exposure time your camera will set. For the infrared Nikon Z7, this was a 30-second shutter speed at ISO – 25600. We’re met with a totally clean, flat black image. No internal IR LED here. This is another huge plus for the Z7. This lens does have a hotspot starting between f/8 and f/11. 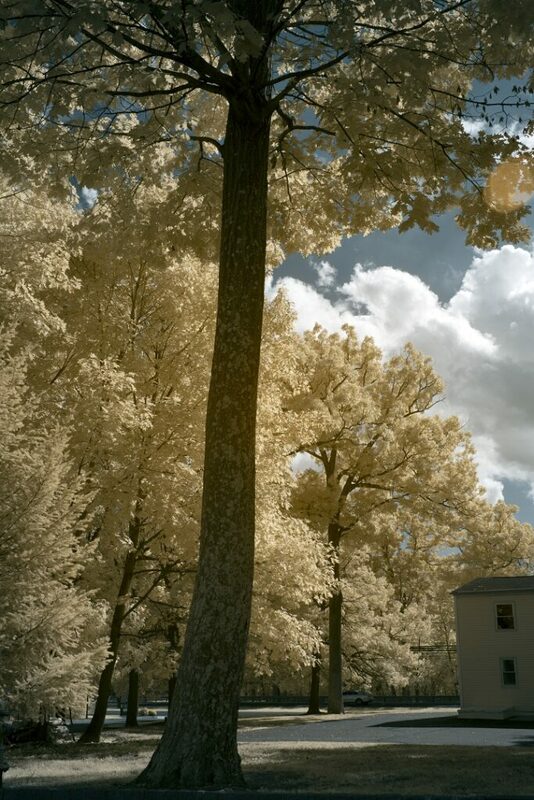 Not perfect, but definitely very usable for infrared photography. The infrared Nikon Z7 is a very strong contender among the latest and greatest infrared photography equipment. Its white balancing capability is lacking compared to other brands, but an improvement on its predecessors. This camera has no internal IR LED making is a great choice for long exposures and maybe even astrophotography. We did find some horizontal sensor lines, but unless you’re using those extra megapixels and cropping in your images significantly, they will be nearly impossible to detect. 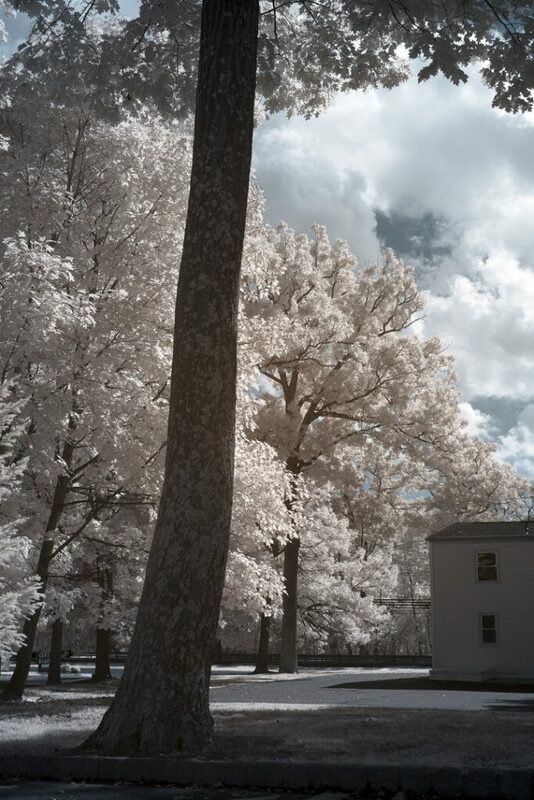 Lastly, the lens is a mild hot-spotter and is certainly usable for infrared photography. All things considered, the infrared Nikon Z7 has room to improve, but it is a very good infrared camera. If only they made it in gold. Really helpful article. As you report, the artifact sensor lines can be a real problem in a Sony IR converted camera. I had you convert a Sony A7RII to IR using an 850nm filter. The sensor lines were so bad (in my opinion) that I ultimately reversed the Sony A7RII IR conversion back to visible light. I have not seen sensor lines on my Nikon 800e that you converted to IR for me, again, an 850nm filter. When I first saw those sensor lines, I did not know at the time what they were. I now know. Also, I haven’t had difficulty with custom white balance on the 800e. I would like to know how the Nikon Z7 stacks up against the Nikon 800e. Can you let me know? Have you run the same IR tests for the NIKON Z6? Did you use the Nikkor Z 24-70 mm lens shown in the photo for the Z7 test? Did you see any hot spot problems with the Z 24-70? wow,,i wish i read this article before i did a conversion with a competitor…Shame on them for not having this information and shame on me for not doing more research…And i saw a hot spot problem with the 24-70 also..lots of PP for me to get these images corrected..
Jon … the F mount Nikkor 24-70 has been reported to have hot spot problems because of the coating they put on the inside of the barrel. The Z mount Nikkor 24-70 is a new beast and may or may not have this problem.